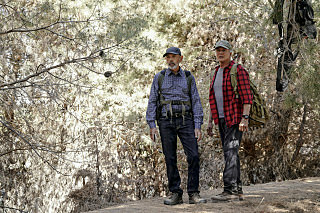 NCIS 16.04 - "Third Wheel"
robber hiding in the woods near him. Thanks for the thread! Glad to see Fornell back! poor gibbs: he just wanted to spend some time at his cabin and enjoy the silence away from the city. think this story was better than the one about the crime itself. ducky's book is coming out soon. I really liked this episode! Fornell and Phil showing up at Gibbs' cabin and fighting over who will stay at the cabin was so funny. So was the rest of the episode with them. Rest of the episode was good too. I liked that McGee/Palmer exchange too.